Do commercial vessels ignore Class B AIS? Apple iPads have become a really interesting platform for marine navigation apps. There are literally dozens of apps that span everything from charting to radar to tides and currents. 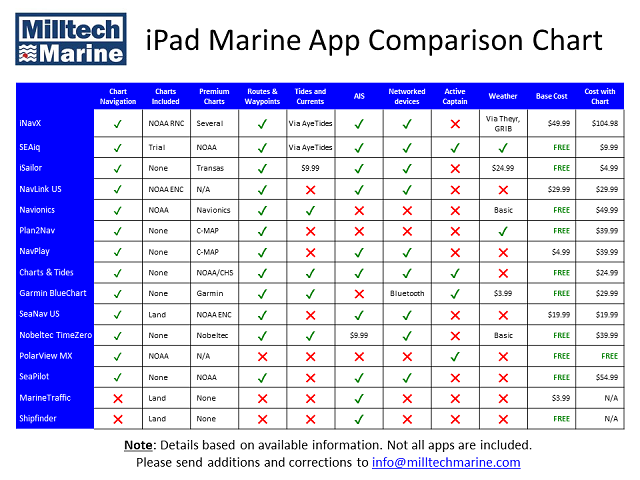 This article provides a quick comparison table of the key features and costs for some of the most popular iPad marine navigation apps. Following our popular post on integrating the Standard Horizon GX2000 with the AMEC CAMINO-101, this article discusses how to use the latest AMEC AIS transponder, the CAMINO-108, with the GX2000. In case you missed it, Rose Point Navigation Systems have low-cost raster and vector charts covering BC Canada for Coastal Explorer. Touch-based tablets are all the rage and more and more boaters are looking for ways to use a tablet for marine navigation and AIS target display. We have had a number of customers come to us and ask for a low cost solution that combines a Class B AIS transponder, a DSC-enabled VHF radio and a basic AIS display with as few components as possible. One way to do this is to build the solution with the AMEC CAMINO 101 Class B transponder and the Standard Horizon Matrix GX2000 VHF radio with AIS display. One question we get asked a lot when customers are looking to buy an AIS Class B transponder is: "can I use my existing GPS instead of needing to install yet another GPS antenna on my rail"? We have been getting a lot of requests for ways to get AIS data to an iPad. This post outlines one method that worked very well plus allowed my other devices to also use the same AIS data. This article discusses how GPS antennas and receivers work with AIS transponders and receivers. One of the most common questions we get from customers is "I've set up my new transponder but no one can see me". In virtually every case the transponder is working fine so here are some things to keep in mind when installing and testing a Class B AIS transponder. Antenna splitters - good idea or not? We get asked fairly often whether using a VHF antenna splitter to share a single antenna with a VHF radio and an AIS device is a good idea or not. This post gives our point of view which will hopefully help you decide what right is for you.